The DC HeroClix: War of Light - Alternate Color Lantern Pack includes two each of the three different lantern packs: Red and Violet Lantern Pack, Orange and Indigo Lantern Pack, and Yellow and Blue Lantern Pack. Each individual pack includes 1 Central Power Battery Resource Object and 7 Construct Special Objects for each color contained within the pack, for a total of 16 HeroClix pieces per pack. 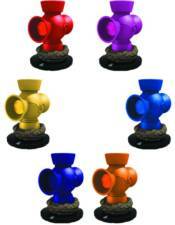 Each DC HeroClix: War of Light Lantern Pack adds an additional thematic element to players' Lantern Corps forces!